Hairy oak is a striking and popular reddish brown warm coloured Australian timber. It is heavily striated with thick visible brown striations and knots. It is named hairy oak for its thick, wiry, hairy bark. 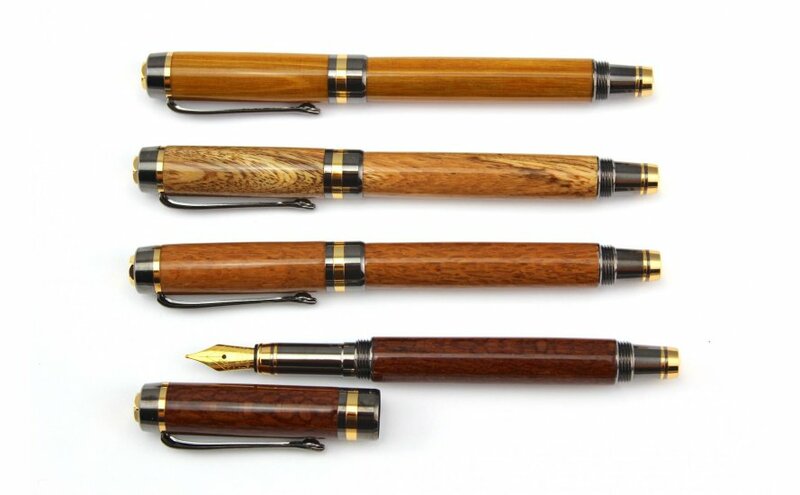 This classic style wooden rollerball pen is created by an artisan who hand turns each pen on a lathe in North Brisbane. Using a meticulous thirteen step sanding process and 10 coats of CA we highlight the simple, innate beauty of the Australian hairy oak timber. The natural uniqueness in the woodgrain and timber colour variations, means that each pen we create is one of a kind. The classic style rollerball is two toned and features 24 kt gold plating and distinctive gunmetal grey fittings. It has a tough iridium nib made in Germany and a threaded lid that can be effortlessly placed on the end of the pen so it is never misplaced. The pen comes in a quality, black presentation case, but if you would prefer an engrave-able timber pen box, please see below for options. This beautiful pen uses easily replaceable, rollerball refills and comes with a premium german black gel ink refill. Buy additional rollerball refills here.